If in-person or online SAT tutoring through Manhattan Elite Prep is not a possibility for you, the study guide for this exam is critical. Many students often are confused as to what to pursue in regards to SAT study guides, textbooks or practice test. In regards to SAT study books, here is an option for you with a comprehensive breakdown to help you find your way in the bookstore! 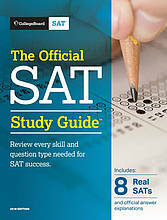 The Official SAT Study Guide includes 8 official SAT® practice tests created by the test maker. As part of the College Board’s commitment to transparency, all four practice tests are available on the College Board’s website, but The Official SAT Study Guide is the only place to find them in print along with over 300 pages of additional instruction, guidance, and test information. Launching in March 2016, the new SAT introduces new question formats and content. Be ready with strategies and up-to-date information straight from the team that created the exam. Students will gain valuable experience and raise their confidence by taking practice tests, learning about test structure, and gaining a deeper understanding of what is tested on the SAT.